KOLKATA: Messi’s Argentina has survived and Brazil is finding its rhythm. A spirited South Korea has stunned defending champions Germany and Kane and Lukaku seem to be hungry and thirsty for more. And that hunger and thirst seem to have rubbed off on Kolkata, 5,500 km away from the scene of the star wars. Football fever has pushed up footfall at the city’s pubs and bars by 15% and it could rise to 20% more than the usual number by the time the quarter-final matches start, believe restaurateurs. The consumption of beer has galloped even faster, with the Hotel and Restaurants’ Association of India (HRAEI) saying beer sales have gone up by 30% during the evening matches. Unlike previous World Cups, almost half the matches from now on are scheduled at 7.30 pm, which is ideal for a mix of dinner and football. And restaurants are rushing to roll out the red carpet for Ronaldo, Neymer and Messi fans. Many have put up giant screens and additional TV monitors to let visitors watch the matches from every possible angle. Chili’s, for example, has set up extra screens across its three outlets at Quest, Acropolis and South City malls. “The crowd has already started building up and, as the football fever peaks over the next fortnight, we could witness a 20% rise in footfall. Evening matches are ideal for those looking to dine out without missing the football. We already have enough screens and are making sure to cover every nook and corner of our restaurants,” owner Rishi Bajoria said. 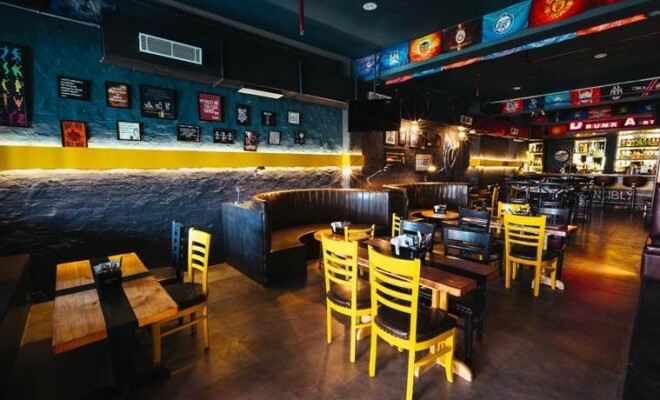 Oasis is one of the few on Park Street with TVs and the restaurant is determined to let every football fan enjoy the World Cup even as they settle down for dinner. If the weather holds, restaurants and bars could be making merry, felt HRAEI president Sudesh Poddar. “Footfall has already gone up substantially and, as the contest hots up over the next two weeks, it should rise further. We expect a 20% spurt by the first week of July,” he said. “We have started getting families out to enjoy the match over a meal. This is happening only because of the timing, which suits them, and it’s good for us. An early start means you can have your dinner, watch the match and catch a taxi back home,” Oasis owner Pratap Daryanani said. Mezzuna has witnessed a spurt in footfall since the beginning of the month. “With the exams getting over and the summer vacation continuing, we have had good attendance throughout June. The World Cup has increased the crowd,” said Ankur Mondol, manager of Specialty Restaurants (which owns Mezzuna). Pings on Middleton Street has installed a big screen. It expects a 15% rise in footfall as the World Cup reaches the quarter-final stage this weekend; that has prompted the introduction of beer and cocktails at lower rates. Pings is also offering drinks from countries that are playing. “We expect a larger turnout once the knock-out matches begin,” said Drishleen Sethi of Pings. Nightclubs, too, are gearing up to join in the football fun with big screens and offers on food and beverages. Shisha has all tables booked for the final match on July 15. Footfall has risen by 15% over the last week and it could get to around 25% during quarter-final matches, hoped Shisha marketing and strategy head Shivangi Bhambani. “We are being flooded with enquiries about offers and whether we would be staying open till the end of the latenight matches,” Bhambani said. Shisha is offering cocktails tailor-made for the matches — there will be Brazilian Ginga when the Selecaos meet Mexico in the quarter-final, and Spanish Bud Sangria when Spain plays next. When Argentina plays France, you can choose from ‘The Argentinian Hand of God’ and ‘The French Connection’. Sector V nightclub Ten Downing Street has seen a sharp 30% growth in football ever since the World Cup kicked off. “We have put up two big screens for the matches, apart from eight TVs,” said Alka Kedwal of the pub.